FOLSOM, CA--(Marketwired - May 30, 2017) - AgreeYa Solutions, a leading global software, solutions and services company, is proud to announce it was named the winner of a Bronze Stevie Award in the Company of the Year category at the 15th Annual American Business Awards. This is AgreeYa's third year in a row winning a bronze in this category. Nicknamed the Stevie's for the Greek word meaning "crowned," the awards will be presented to winners at a gala ceremony at the Marriott Marquis Hotel in New York on Tuesday, June 20. "AgreeYa is once again honored to receive a Stevie Award recognizing us as one of the top companies of the year," said AgreeYa Solutions managing partner Ajay Kaul. "The company has been fortunate to experience growth and advancement this past year and I believe the quality of our solutions and the support we provide has gotten even stronger. To receive such a prestigious award such as this -- for the third year in a row -- signals that we are doing something right." More than 3,600 nominations from organizations of all sizes and in virtually every industry were submitted this year for consideration in a wide range of categories, including Startup of the Year, Executive of the Year, Best New Product or Service of the Year, Marketing Campaign of the Year, Live Event of the Year and App of the Year, among others. AgreeYa was nominated in the Company of the Year - Business & Professional Services category for large companies. More than 190 professionals worldwide participated in the judging process to select this year's Stevie Award winners. For more information about AgreeYa and its solutions and services, please visit http://www.agreeya.com/. 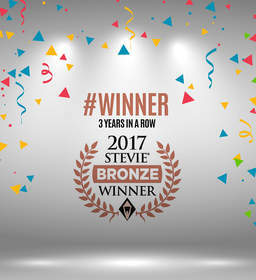 AgreeYa Solutions named winner of Bronze Stevie Award in Company of the Year category.